So all the talk after Champions League and Europa League fixtures is how will the team cope playing Thursday and Sunday. Clubs will need a massive squad so that they can rotate, keeping the team fresh to pick the right results up. Interestingly out of the top four finishers in the Europa League 2013/2014 they only lost 7 games between them after a European matchday. It is a well known point that there are too many fixtures in the competition, if you reach the final you will play a total of 15 games; nearly half a season in most domestic divisions. After match day one last season, Sevilla the current holders, lost 1 game in 14 after playing on a Thursday picking up 11 wins, 2 draws and 1 defeat. However a key point to add is in Portugal, Spain and Italy; domestic games can be all across the weekend depending on broadcasting and other commitments. In other European leagues, some teams will play the majority of their games on the Saturday but with the Europa League this changes. There has been four match days in the competition so far, below is the record of all the Europa League teams combined in their domestic fixtures following a Thursday game. The top 7 leagues that were taken were: Premier League, La Liga, Ligue 1, Serie A, Bundesliga, Primeira Liga and Eredivisie. As the results confirm, there is a 20% difference in the win percentage of the top leagues and the rest. Only one team remained unbeaten in all 4 matches after the Europa League in PSV who have won all four. 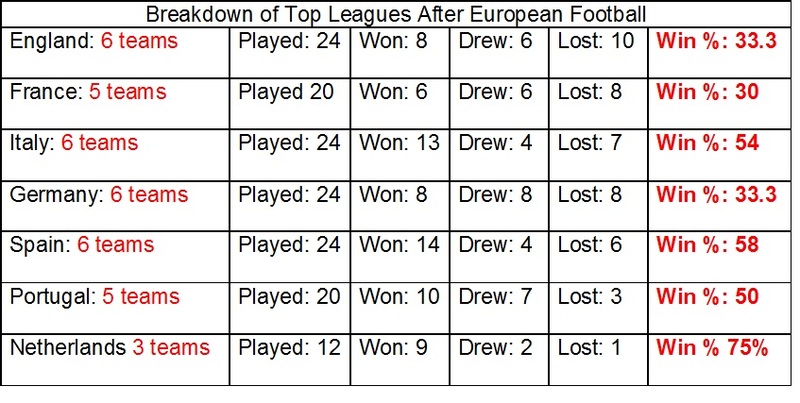 Interestingly is how the different leagues in Europe compare when broken down. The best performing teams after a midweek match day are in the Netherlands with PSV and Feyenoord winning 6 out of the 8 matches. The French trio have only picked up 2 wins out of 10 with Guingamp losing all four matches. Guingamp won the French Cup earning their place in the competition but with little resources and experience of Thursday/ Sunday football lie 18th in Ligue 1. In England teams seem to always struggle with the demand on two games in four days with squad depth becoming an ever growing issue. Between them, Everton and Tottenham have only won two matches out of 8 and losing 4. Only Fiorentina (31) have made more changes from their starting 11 on a Thursday to a Sunday than Tottenham (29). The Premiership is deemed one of or if not the most competitive league in the world which means it is hard to compare to other European Leagues. But Feyenoord (6) and PSV(4) have made the least amount of changes, highlighting that players can play 2 days in four days. The age old question is can a team be successful on all fronts making so many changes? All top clubs domestically in Europe will be striving to participate in the Champions League with the sponsorship, revenue and media influences. With a new broadcasting deal set to start from 2015/2016 season from BT Sport there appears to be a 108% increase on the revenue teams will receive for qualifying to the Champions League. Champions League includes the top teams from all of the European leagues and with these big teams comes TV deals. Typically these big teams will play in one of the televised slots throughout the weekend. After the last round of Champions League fixtures all of the English, Italian and French teams played in televised slots either on Saturday or Sunday. So not only do they play a day or two before the Europa League teams they are more likely to have a prolonged break before their domestic fixture. There is a higher win percentage after a CL match day but then again the quality is higher than the Europa League teams. The English four have only one 6 out of then 16 matches compared to Italy with 6 out of 8 and Spain 9 out of 16. Surprisingly Germany has the lowest win percentage with runners up Borussia Dortmund only winning one game and Schalke winning none of their games after Europe. It appears that no matter what competition you play in, teams will always be unpredictable after Europe with long travel and squad rotation becoming factors. La Liga is the top domestic league after European football but as you may think out of the 14 wins the big two in Real Madrid and Barcelona won 50% of them. European football brings in much needed revenue, sponsorship and attention to all the different leagues but it has been noted that teams look lethargic after a European match day. Many have reported on the effect a midweek European game has on a domestic team and their performance. A mix between consistency and squad rotation appears to knit European and domestic football together: too much change can have a harmful effect on domestic football. This entry was posted in Champions League, England, Europa League, European Football, Football, Internationals and tagged Champions League, England, Europa League, European Football, Football, Internationals. Bookmark the permalink.